Something was wrong, dead wrong! The Texas Ranger called Solitary felt it before he was ten seconds inside town. Minutes later he knew it for sure – when the honest sheriff who’d sent for him tried to gun him down on sight. And within the hour Solitary found that almost to a man the whole town hated him, sight unseen . . . even though he was their only chance to survive the terror. And Solitary Jackson was going to find out what it was! I’ve read quite a few books by Barry Cord and this one was just as enjoyable as any of them. Told in a tough style the story really grabbed my attention from the opening sequence in which a man is killed by a strange arrow that is unrecognized by the townsfolk. So where did this arrow come from? Why was this man killed, after all he was just a tenderfoot Easterner dish washer in the local hotel wasn’t he? What was the note he threw into the Sheriff’s office just before his death? And as the story unfolds these aren’t the only questions that will need answering. Barry Cord, a pseudonym used by Peter Germano, is a master at writing tense scenes, you share the frustrations, fear, anger and joy of his well-drawn characters who are often hiding their real identities. His pacing is superb as his plots twist their way to their satisfying conclusions. 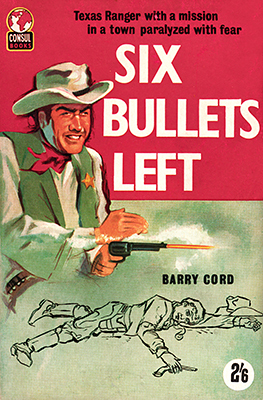 Six Bullets Left contains all these elements and left me wondering if there are any more Barry Cord books featuring Solitary Jackson. One disappointing thing to note about this particular publication of Six Bullets Left is the amount of typos and the book even has a couple of lines missing in a gunfight that was a little frustrating – although it was possible to work out what had happened by what came next. Of course this isn’t the authors fault but that of the publisher, so you may prefer to find a different pressing to the one shown above and hope it doesn’t contain the typos this one does. White Elk, a famous Indian Scout, is searching for his father on the bullet-strewn streets of Abilene. A half-breed, he runs into trouble when a band of Kiowa braves tracks him down, vowing vengeance on the man they call traitor. The U.S. Cavalry arrives to keep the peace, but it’s up to Marshal Luke Travis and Deputy Cody Fisher to safeguard their hair-trigger town. One cavalry sergeant vows to settle his own score with White Elk – any dirty way he can. Forced to fight for his life, the half-breed becomes a lightning rod for slaughter. As Indians attack the Kansas boomtown, it’s a war to the bloody end! 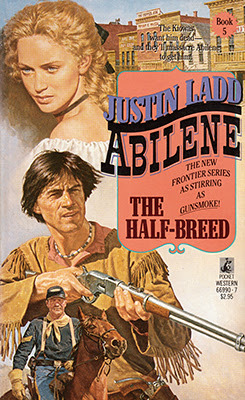 Although many of the people who have appeared in the previous Abilene books have parts to play in this one too, they become secondary characters to White Elk and those directly involved in his quest to make peace with his father and those who are out to kill the half-breed. Justin Ladd builds the suspense as to just when the Kiowa will hit town and also includes a secret that could explode at any time – something White Elks father is hiding from his son. And what of the seemingly growing attraction between the half-breed and his father’s new wife? That is something else that can only end in disaster surely? Sergeant Drake and Rita Nevins further complicate matters, the latter’s jealously perhaps about to lead to more deadly trouble for White Elk. So, as you’ll realize, there is plenty to keep the readers interest and to make you want to discover how it will all turn out. The violence is hard-hitting and brutal at times, leading to a sad death for one of the characters. The final showdown with the Kiowa is a desperate struggle for White-Elk but as to why this is I can’t reveal here without spoiling that part of the story, so I guess you’ll have to read the book yourself to find out. If you enjoy series westerns, particularly those that revolve around a town and the people who make up its population then I can’t recommend this book, and the series, enough. Of course the fact that the man behind the pseudonym of Justin Ladd is James Reasoner should also tell you that you’ll be in for an excellent read if you can find a copy of this book. No matter the odds, U.S. Marshal Alvin LeRoy always completed his assignments. That’s why they sent him after the Reno bunch. LeRoy was single-minded once he was on the trail. He wouldn’t back down and had a fearsome reputation for always finishing what he started. His pursuit took him across southwest Texas, where he faced up to bushwhackers and the aftermath of a massacre as he relentlessly tracked down and dealt with the worst bunch he had come across in quite a while. Following a trail of deception and danger, he eventually ended up in New York. Here he faced the menacing top man of the crime syndicate who was behind the whole affair, and didn’t stop until there wasn’t a man left standing. Neil Hunter has been writing westerns for many years, most notably his Bodie the Stalker series and the Brand series. This, LeRoy U.S. 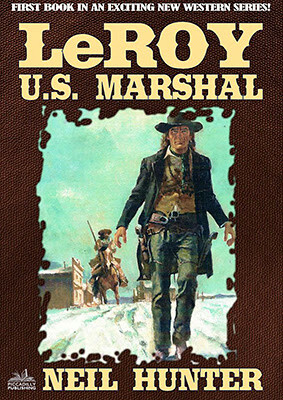 Marshal, is the first in a new series, although readers of the book ten in the Bodie series will have already met LeRoy. Hunter also links Bodie and LeRoy in another way in this story but I can’t reveal the why and how here without spoiling the tale for those who’ve yet to read it. As expected Neil Hunter has written a gripping story that is filled with action, tough characters and descriptive prose that paints vivid imagery within the mind’s eye. Hunter also includes a little of LeRoy’s backstory to explain what motivates him. Neil Hunter has also chosen to present this fast paced tale without chapters, instead just relying on scene breaks when changing location or from one character to another. On the strength of this book I’m hoping LeRoy will return in many more stories and that I won’t have to wait too long between books.